The global phenomenon parkrun organises free, weekly, 5km timed runs in open spaces around the world. They are free, safe and accessible for anyone who wants to walk, jog, run or volunteer. 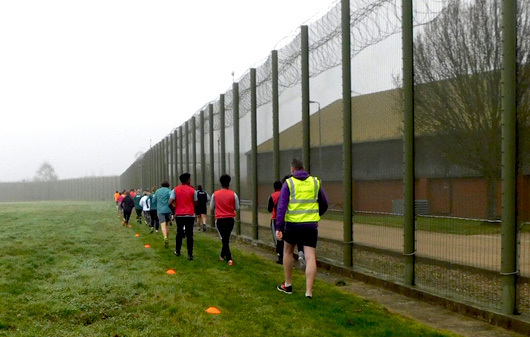 One of the aims of parkrun is to have an event in every community that wants one, and with this in mind, parkruns have been gradually launching in UK prisons. The thinking behind this is that the power of sport has been used, with fantastic results, to reduce reoffending. By linking prisoners with a weekly event that also takes place on the outside world at the same time (Saturdays, 9am) upon release they hopefully find the impetus to participate in a local parkrun, integrate into the community (parkrun community and beyond) and avoid reoffending. 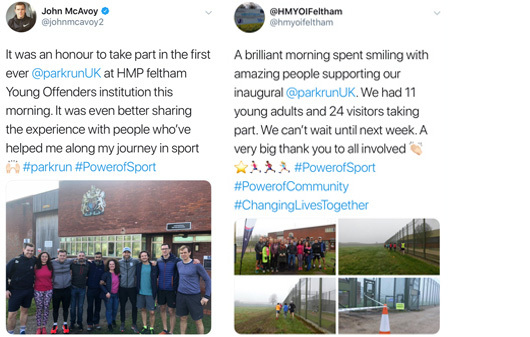 In 2018, HM Prison Feltham in Greater London which includes a Young Offenders Institution, started looking into establishing their own parkrun for young inmates and prison staff. Churchill Hui’s Claire and Kevin Crook have been involved in parkrun for several years, both as runners and volunteers. Claire is Co-Event Director at Bedfont Lakes parkun, which takes place a stone’s throw from HM Prison Feltham. 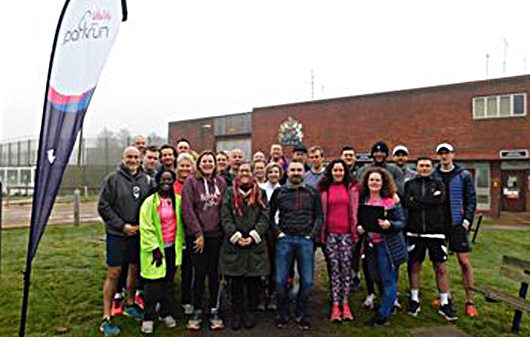 Claire and Kevin, along with some of the Bedfont Lakes core team, business partners, supporters and inspirational athletes, attended the inaugural parkrun at Feltham in February 2019. Here we share the insightful official run report produced by the Feltham team. For our inaugural event on Saturday 23rd February we invited a number of business partners and supporters to come in and run, jog, walk, volunteer or simply encourage those doing so. We were lucky enough to have Paul Sinton-Hewitt CBE, the founder of parkrun join us with a number of the ambassadors from local courses. We also had Marcus Gayle, ex-professional footballer; Cai Griffith, former international rugby player; Rob Williams, silver medalist rower at the London Olympics; Professor Rosie Meek, who has recently published A Sporting Chance, a review in the power of sport in reducing reoffending; Ivo Gormley, founder of Good Gym; and John Mcavoy, a former prisoner who has turned his life around through sport who is now the only Nike sponsored Tri-Athlete. We also had representatives from Nike, Redbull, Volvo, Saracens RFC, Kick it Out, Gloves not Guns, London Welsh RFC and local football clubs. We had 46 participants on the morning including 31 ‘runners’, 11 being young adults and the rest acting as volunteers in roles including timekeepers and marshals. It was amazing watching our boys unconsciously partner up and run with the visitors. There were genuine smiles from everyone involved and a real community buzz. The young adults all gave really positive feedback as did the guests, all of whom are really keen to return and support again. The initiative will carry on as part of the gymnasium programme every Saturday morning at 9am as it does on the ‘outside’. We hope that the participants who start their parkrun journey in Feltham will continue it on release. Feltham parkrun will look to host visitors every 4–6 weeks, opening the invite again to business partners and those who offer us support. Feltham’s ‘sister’ parkrun is 100 meters across the railway line at Bedfont Lakes and we are believed to be the two closest events in the world.